Seven firearms, drugs and 1,100 rounds of ammo were among items seized from an Arden neighborhood. 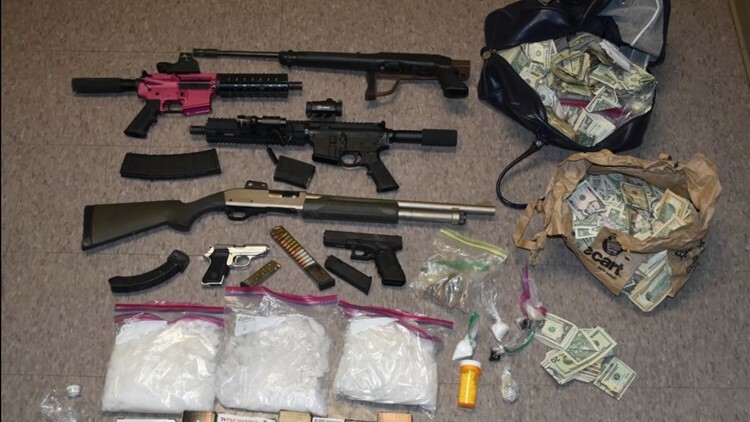 SACRAMENTO, Calif. — Two people were arrested Friday for multiple charges related to drugs and firearms, according to the Sacramento Police Department. The department's North Gang Team seized ammo, weapons, drugs and thousands of dollars in cash from a location in the 1300 block of Morse Avenue. In a post shared Saturday, the department shared the photo below, along with a list of the items seized. Sacramento Police officers arrived to the College Glen neighborhood around 3 a.m. where they found a man who had been shot with a pellet gun. The victim was later identified as 21-year-old William Molina, a student at Sacramento State.